We Defy Augury: "The First Proven Expedition to the North Pole"
New York Times Magazine - "An Insurance Salesman anda Doctor Walk Into a Bar,and End Up at the North Pole"
"The scene before them was not what they imagined back in Minnesota, when a dare in a bar instigated the least likely polar expedition of all time. 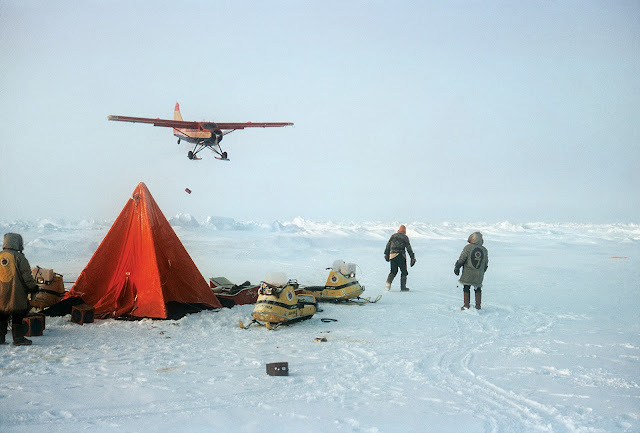 A group of average middle-aged suburban men — an insurance salesman, a mechanic, a doctor, an engineer — had joined forces with a young Canadian adventurer, scion of the snowmobile manufacturer Bombardier, which was sponsoring the voyage. The snowmobiles the men had brought to the Arctic were primitive 16-horsepower Ski-Doos, little more than riding lawn mowers with snow tracks. Now, only a few miles into the journey, the idea of going to the North Pole by snowmobile suddenly seemed dangerous, impossible, insane."